By now you've probably seen the Turtles new Unis created by local athletic apparel company, Under Armour. 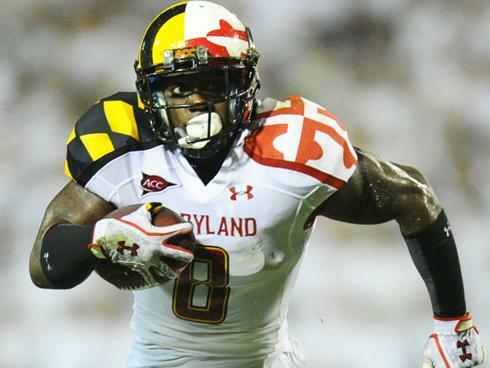 Much like Nike's relationship with Oregon, Under Armour is headquartered in Bodymore, Murderland Baltimore, Maryland.and they see their ability to outfit a premier College Football team in outrageous eye catching uniforms as a fantastic marketing tool. Appropriately so too, the impact that Nike has had on Oregon was huge and from the fan's perspective it's a very symbiotic relationship. Despite fielding many competitive teams and some very talented players over the years, Maryland has remained notable only in their unmemorable nature. Well that all changed two weeks ago when then stormed the field in those high contrast seizure inducing unis above. While those are far from eye pleasing they are awesome. Any kind of identity is probably going to be a good one for Randy Edsall's new team. This will positively impact his ability to recruit kids who grew up as UA kids rather than Nike, Reebok, or Adidas kids. It will even help Maryland distinguish itself among a region of the country really lacking in notable football teams. If the Terps are able to establish themselves they are going to be one of the few schools in the DC, eastern PA, and NJ with solid football teams. Rutgers and Temple are on the verge of really establishing themselves in that area and Maryland could put a real damper on those plans. For Under Armour this is a clear shot at Nike. It's incredible how successful their program with Oregon has been. The swoosh's allure to nationally ranked recruits has drastically improved the level of football Oregon is able to put on the field and coach Chip Kelly's speed obsessed system has meshed perfectly with Nike. As the Ducks got better they found themselves in the National Championship last season and there was probably just as much media focus on the zippy Nike uniforms as there was on the speedy offense. While it probably costs Nike some big bucks to outfit the school like that, the payoff in free advertising is tremendous. It's for that reason just as much as it is Terrapin pride that you will now be rendered vision impaired while watching Maryland games.